Those familiar with the problems of excavating through non-cohesive saturated soils below the water table will appreciate that preventing the running-in of particles during excavation is a major challenge to the contractor. With the continuing wave of investment into London real estate and the sustained increase in property values, the preferred solution for investment clients and owner/occupiers is the formation of deep basements under existing high value properties. This introduces a range of practical difficulties at the construction phase. One common problem is how to construct a basement below the water table in non-cohesive deposits such as River Terrace Gravels. The development of a reliable method of soil stabilisation of non-cohesive soils in difficult to access locations has become urgent. In this case study, we discuss a high value and high demand project in London’s Knightsbridge district. 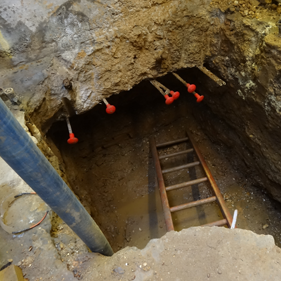 Excavating at depths of up to 3.5m below the water table in non-cohesive sand and gravel beneath the supporting party walls of a significant property in the west end of London without the danger of undermining the support for the adjacent properties and causing settlement damage. 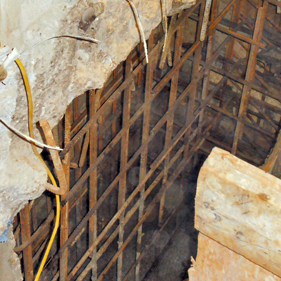 Stabilise the ground at, and for, the depth of excavation required to both control water in flow and provide a soil which is capable of being excavated by hand using standard underpinning techniques. 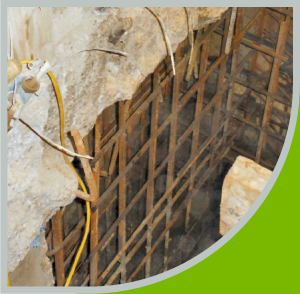 Stress UK designed and installed a bespoked stabilisation system using the unique patented ReFORCE lance technology to place geotechnical resin accurately in the ground to form a temporary works condition that allowed the underpinning specialist Abbey Pynford to complete their basement construction ahead of time, safely and to budget. 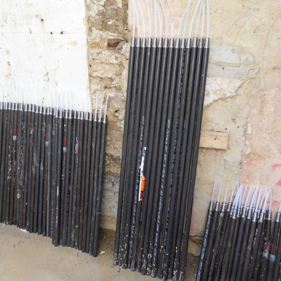 ReFORCE injection lances ready for installation. 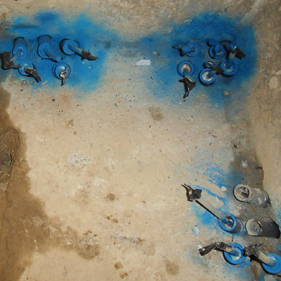 ReFORCE lances in position showing grouping of different angles of installation. 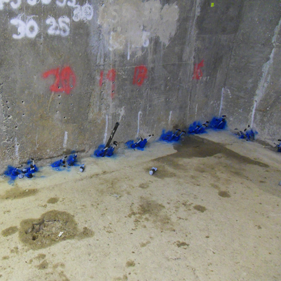 ReFORCE lance groups installed along the perimeter wall to depths of 4m below slab level. Open excavation in stabilised water bearing sand and gravels. Completed underpinning excavation ready for concreting. 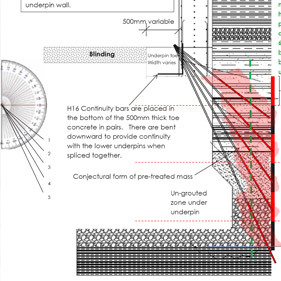 Our pre-treatment schematic of the underpin section demonstrated drilling angles, minimum horizontal penetration depth and position of H16 continuity bars.